7/29 Cup of Coffee: The Red Sox affiliates only managed three wins on Monday, both featuring dominant pitching performances. Mike Augliera (pictured) fired eight shutout innings for Portland despite a long interruption from Mother Nature. A quartet of GCL Red Sox hurlers combined for a seven-inning no-hitter in the first game of a doubleheader, while a ten-run barrage led them in a nightcap. A late comeback fell short as the Pawtucket Red Sox dropped a 6-4 decision to the Scranton/Wilkes-Barre RailRiders (NYY). It was a rare tough start for knuckleballer Steven Wright, who allowed five runs on nine hits in six innings. After giving two runs in the first and three in the third, Wright did settle in, closing out with three straight shutout frames. Garin Cecchini homered for the first time since June 26, a solo shot in the second inning. It was only the third extra-base hit in the month of July for Cecchini. Travis Shaw blasted his 20th home run of the season and ninth since his promotion to Pawtucket. Corey Brown was 2 for 4 with a double and triple, and Ryan Lavarnway collected a pair of hits as he continues his rehab assignment. Mookie Betts was 0 for 4, ending a seven-game hitting streak. The Portland Sea Dogs knocked off the Reading Fightin Phils (PHI), 2-0 through the dominant work of Mike Augliera. The right-hander faced the minimum 24 batters in eight shutout innings. Both of the hits of Augliera were singles, and both were promptly erased via a double play. Those were two of the 15 groundball outs that Augliera induced, while also striking out four without issuing a walk. What made Augliera's outing all the more exception was the weather conditions. With Portland up 2-0 after two innings, the rain that tore through New England on Monday reached Hadlock Field. The game was delayed for 80 minutes, but Augliera not only remained in the game but continued to dominate. Robby Scott fired a perfect ninth inning to seal the two-hit shutout. A pair of solo home runs by Blake Swihart in the first and David Chester in the second gave the Sea Dogs all of the offense they needed. Swihart's homer was his 12th, after hitting only nine in his first two plus pro seasons. He added a third-inning single, and is 14 for 33 (.424) during his eight-game hitting streak. The Greenville Drive mustered only two hits in its 4-0 loss to the Hagerstown Suns (WAS). A run of strong starts by Daniel McGrath came to an end, as the Australian left-hander struggled. He allowed three runs on five hits in 3 2/3 innings, his shortest appearance since his first start of the season. He also walked four and uncorked a pair of wild pitches while striking out three. Sergio Gomez allowed a run on one hit in three innings of relief, and Mike Adams finished with two shutout frames, striking out three. In 50 2/3 innings dating back to last season, Adams has an impressive 50 strikeouts to only eight walks. Despite tallying 13 hits, the Lowell Spinners fell 8-5 to the Brooklyn Cyclones (NYM). Joseph Monge scored a pair of runs, going 3 for 5 with a double. Sam Travis, also had a 3-for-5 night, adding a triple and pair of RBI. Danny Mars was 2 for 4 with a walk, and has now hit safely in 11 straight. Mars also lit up the bases, stealing three times. Mauricio Dubon, honored yesterday as last week's New York-Penn League Player of the Week, also had two hits for the Spinners. 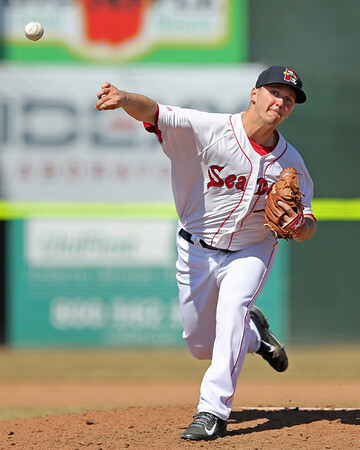 Left-hander Jake Drehoff turned in a strong start for Lowell. He threw five innings and surrendered only three hits, with the only run coming on a fifth-inning solo homer. He struck out six and walked one. Rob Smorol had a tough outing out of the bullpen, giving up six runs (five earned) on six hits in one inning, taking the loss. Ellis Jimenez gave up just an unearned run in his three innings of work. Four GCL Red Sox pitchers combined to no-hit the GCL Orioles in a 2-0 win in the completion of a game that started on July 17. Jeffry Fernandez started things off with three perfect frames, striking out five, when the rain forced the postponement. When play resumed Monday, Brayan Villarreal was first to the mound, striking out one in a perfect fourth inning as he continues his rehab assignment. Yankory Pimentel threw two innings for the win. He struck out two and allowed the game's only baserunner, who reached on a fifth-inning error. Jose Almonte earned his first professional save, striking out two in a perfect seventh.At the plate, Rafael Devers had two hits and an RBI, all coming back on the 17th. In the regularly scheduled contest, the GCL Red Sox powered past the Orioles, 10-3. Trenton Kemp led the way, blasting a fifth-inning grand slam that blew the contest open. It was the first professional homer for Kemp, who also doubled as part of his 2 for 4 day. Darwin Pena was 2 for 4 with a double and three runs driven in. Top draft pick Michael Chavis ripped his fourth double of the season. Though Devers was 1 for 4 with a run scored to extend his hitting streak to eight games, his batting average actually fell below .400. He now stands at .397 since his promotion to the Gulf Coast League. On the mound, third-round pick Jake Cosart first two scoreless innings in his second appearance. Cosart allowed one hit and struck out one. Luis Ramos was the beneficiary of the outburst from the offense, getting the win despite allowing three runs on seven hits in four innings. Keivin Heras finished, striking out one in a scoreless seventh. Little went right for the DSL Red Sox in a 10-1 loss to the DSL Giants. Two of the Sox three hits came off the bat of Raiwinson Lamenda, including a second-inning solo home run. Lamenda has been hot, going 10 for 24 in his last six games. It was a very tough start for the normally reliable Ritzi Mendoza. Mendoza gave up six runs on three hits, walking four and striking out one in his only inning of work. The struggles caused Mendoza's ERA to balloon from 2.48 to 3.73. Player of the Day: Portland got more than it could have asked for out of Mike Augliera. Able to save the Sea Dogs bullpen by coming out to pitch following an 80-minute rain delay, the former Binghamton Bearcat turned in a dazzling performance. He induced 15 ground ball outs and faced the minimum 24 batters through eight shutout innings.